Home » Email vendor Selection Articles » Will cloud based email Infrastructure replace on-premise MTAs? 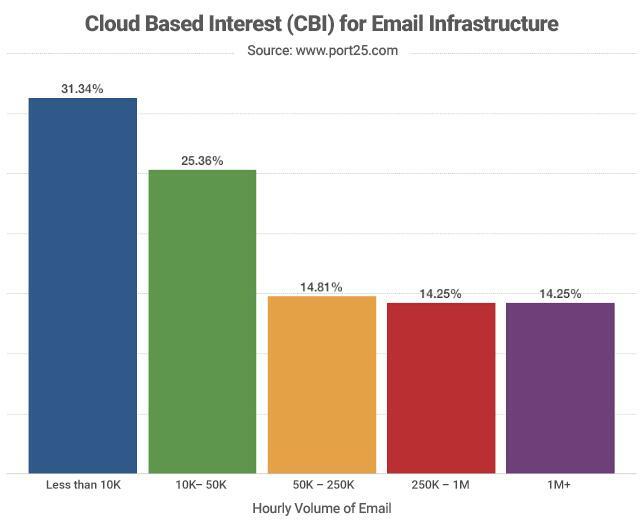 Cloud-based interest in email infrastructure is trending up. Will on-premise be totally replaced in the future? The statistics are certainly in line with general industry trends, which place public cloud services on a trajectory to grow 17% in 2016. This growth represents a 22% increase in SaaS and a whopping 43% growth in infrastructure as a service (IaaS). We track cloud-based interest (CBIs) among large volume senders based on evaluation and purchase requests received, in combination with overall site engagement. In Q3, CBIs on Port25’s website grew by 34.97% over Q2, to a total of 48.2% of unique evaluation and purchase requests. Essentially half of all visitors who made inquiries at the port25 site were interested in learning more about cloud-based infrastructure for email. Our CBI number has been hovering around 38% of unique evaluation requests since Q1 of 2015 , so this uptick represents a significant upward spike in interest in cloud solutions. Our trend numbers are created by placing data from unique inquiries into five different volume bins. These are based on a client’s maximum email messages per hour: less than 10K, 10K-50K, 50K-250K, 250K-1M, and 1M+. The 1M+ category includes some very large senders since Port25 has customers who send more than 1B emails in a given 24-hour period. The number of users who opted-in to receive cloud-based information rose most among smaller senders. In Q3, 31.34% of visitors who expressed interest in CBI fell into the volume bin of less than 10K per hour, while 25.36% of requests were generated by senders who mail 10K-50K per hour. Our data suggests that, while senders in the less than 10K category appreciate the convenience of cloud-based email infrastructure, a stronger driver may be that small ESPs lack the resources needed to manage complex tasks involved in hosting their own sending infrastructure on-premise. Moving to a cloud-based email infrastructure can be a cost-effective way for smaller ESPs to meet their investment objectives, maintain security, and outsource the administrative knowledge needed to manage increasing volumes of email while properly configuring server requirements. Among the larger senders, CBI is much lower: roughly 14.81% across the larger sending volume categories expressed interest in cloud services. That number is consistent with the highest volume bin of over 1M per hour, which had a CBI of 14.25%. The largest service providers, (the top 1% of ESPs) have been reticent to migrate to the cloud due to the complexity of their sending environments. One understandable constraint is that large ESPs don’t want to relinquish control of their reputable IP addresses. Reputation aside, certain SLAs among large senders prohibit them from releasing sensitive customer data to a third party. A hybrid of on-premises and cloud-based messaging infrastructure gives ESPs and Enterprises, the ability to quickly and cost-effectively scale operations instantly. Why invest IT time and resources when you can have two solutions that work together? Logical reasons for adopting cloud infrastructure may include redundancy and disaster recovery and the ability to quickly “burst up” in capacity without requiring additional internal IT investment. Some email platforms may use the cloud to manage capacity: when forward-looking demand is high, they partition and migrate some of the volume that can’t be handled by their own hosted MTA to the cloud; when demand is low, the cloud has little overhead and maintenance. Service interruptions can spell disaster for high-volume messaging. 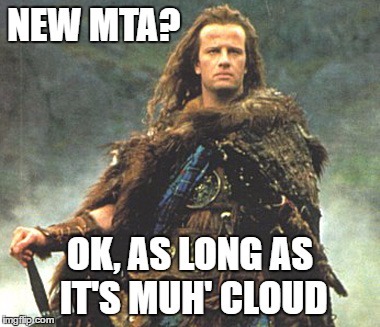 When ESPs or enterprises add a hybrid cloud to their hosted MTA solution, they bring continuity. With two separate systems, one can be seen as a failover if the other is down. The cloud helps provide continuity of service. Continuity is the term frequently used by Email Service Providers and stakeholders of demanding senders. One important challenge when creating a hybrid cloud is to make sure the data from both sources is standardized. You don’t want hours of time to be consumed on the back end trying to reconcile apples and oranges in your data and analytics. The good news is that many cloud-based email marketing solutions can be configured so that their data is normalized to the data you get from your on-premises MTA. While most of the influential senders are not abandoning on-premises mail transfer agent (MTA) solutions, many are looking to cloud infrastructure for managing higher volumes by bifurcating individual email streams to the cloud. High volume senders generally require some degree of custom integration to create a seamless hybrid cloud infrastructure. Concerns about integration may be holding back some larger email senders from using cloud-based services. These headwinds are mitigated by the growing number of small and midsize ESPs that understand the economic and administrative benefits of a cloud solution for email infrastructure.